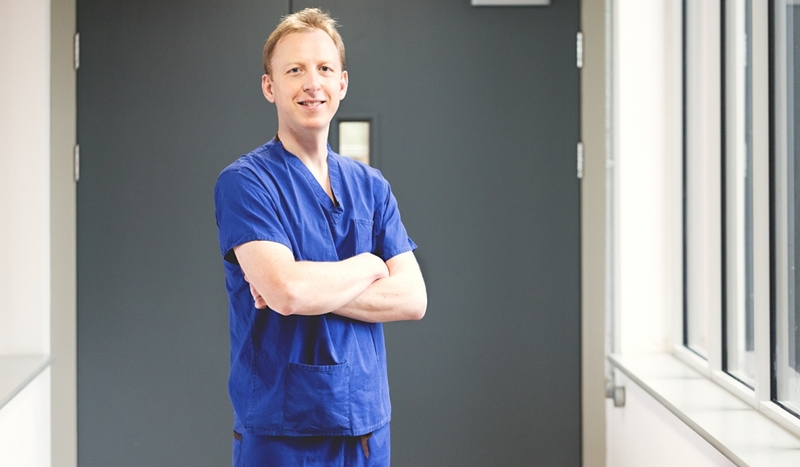 As a specialist in gallbladder surgery, Mr Clarke follows latest national and international guidelines (see resources) in the investigation and management of patients with gallstones, utilizing the most up-to-date surgical techniques, including laparoscopic common bile duct exploration and intra-operative ultrasound. The gallbladder is a small sac attached to the underside of the liver. Its function is to store and then release bile (a fluid consisting of water, bile salts, bilirubin and fats) into the intestine after eating a meal in order to aid digestion of fat. Biliary colic: A gallstone becomes stuck in the exit channel from the gallbladder (commonly after eating a fatty meal) resulting in the gallbladder squeezing repeatedly to clear the blockage. The stone eventually drops back inside the gallbladder clearing the exit. Cholecystitis: As above but the blockage fails to clear and inflammation +/-infection then develops inside the gallbladder. Common bile duct blockage: A stone passes out of the gallbladder into the main bile drainage system (common bile duct) and becomes stuck causing a blockage to bile drainage. Pancreatitis: The pancreas gland, responsible for controlling blood sugar (through insulin & glucagon production) and producing chemicals (enzymes) to help break down food, can develop inflammation when a gallstone passes through the main bile duct and alters drainage from the pancreas gland. Gallstone Ileus: This is a rare condition in which a gallstone erodes through the wall of the gallbladder into the small intestine (duodenum) and can subsequently cause a blockage of the bowel. Generally ineffective and only useful in those not fit for surgery with very small stones. There is a high incidence of stones reforming. Once a decision is made to go ahead with surgery, you will need to attend the pre-assessment clinic at which a number of routine checks and blood tests will be performed. You may be asked to complete a special liver reducing diet in the one or two weeks prior to surgery. The gallbladder is removed using laparoscopic (keyhole) surgery. It requires 4 small stab incisions in the skin (measuring 5mm-10mm), all of which are closed using dissolvable stitches. In a small number of cases (3%) a larger incision may be required. You will routinely be issued anti-embolism stockings to wear during the surgery. The procedure normally takes around 45 minutes. Where the patient has previously had abnormal liver function blood tests or has widening of the main bile duct on ultrasound scan, an x-ray (cholangiogram) or ultrasound is performed during the surgery to ensure no gallstones are in the main bile duct. If stones are seen within a widened common bile duct (over 8mm wide) they can be removed at the same time using a small telescope and basket. Most patients are discharged on the same day as the operation (daycase). Patients are normally ready to be discharged around 4-6 hours following surgery. You will be discharged with painkillers and written post-operative instructions. All stitches are dissolvable. The waterproof dressings are suitable for the shower and can be removed after 7 days. Full recovery takes two weeks after keyhole surgery, but may take 4 weeks after open surgery. a) Shoulder tip pain – This is common after keyhole surgery and normally resolves within 24 hours. It is due to gas used to inflate the abdomen during surgery. b) Bleeding – This can occur with any operation and on occasions may require a blood transfusion (unless the patient expresses a wish not to). It is more common in patients taking blood thinning medications (e.g. warfarin, clopidogrel, dipyridamole). c) Infection – This may affect the wounds, lungs or site of intravenous lines. d) Blood clots in the legs or lungs (deep vein thrombosis or pulmonary embolism) – Patients wear antiembolism stockings to reduce this risk. f) Retained stone – Sometimes a stone may have moved into the main bile duct prior to or during the operation. If it fails to pass through into the bowel it may require a further procedure to remove it. This is a poorly understood condition in which the gallbladder is thought to not empty properly after a meal, resulting in similar pains to those experienced with gallstones. Diagnosis is commonly made using a HIDA scan (a nuclear medicine scan assessing activity within the gallbladder after eating cream or a fatty meal). Surgery can lead to an improvement of symptoms in over 90% of patients. In some patients a small swelling (polyp) may arise from the wall of the gallbladder with or without gallstones. Where a polyp less than 1cm is detected this is normally followed up by surveillance ultrasound, however once this reaches over 1cm in size, current recommendations are for the gallbladder to be removed due to the potential for cancer cells to be found within the polyp. This describes a hardening of the wall of the gallbladder (calcification) giving it a ‘porcelain’ appearance. Due to its possible relationship with future gallbladder cancer, surgery to remove the gallbladder may be recommended. This is a rare cancer and more commonly affects those aged over 70 years. It often causes no symptoms in the early stages but later may cause upper abdominal pain, jaundice and weight loss. If this diagnosis is suspected you may require a more detailed x-ray scan (CT scan) to decide if it can be treated with surgery.